When it’s bluebonnet time in Texas, the wisteria and dogwood are blooming in Arkansas. The purple chandeliers of wisteria, a woody vine that likes to curl itself around a tree to rise into the air, begin dotting the roadside forest as soon as I crossed the border between the two states in Texarkana. 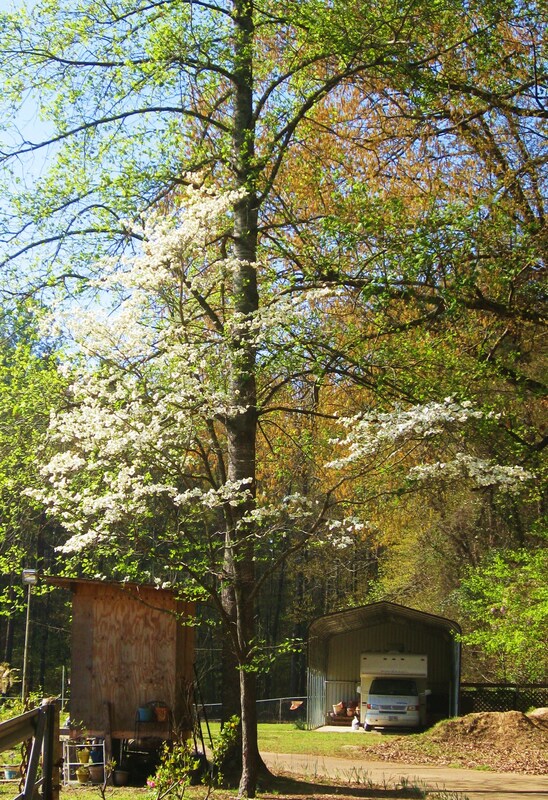 Then every few miles as I drove deeper into the state, a patch of white dogwood blossoms, usually sheltered by some larger tree, would add its delicate voice to the landscape. These purple and white flowers helped ease the pain of leaving the magnificence of Texas bluebonnets waving good-bye from my RV’s rear-view mirror. I arrived at my youngest daughter’s home here in Camden, Arkansas, a few days ago during a late cold spell and overcast days. The sun finally came out yesterday – and so did my camera. 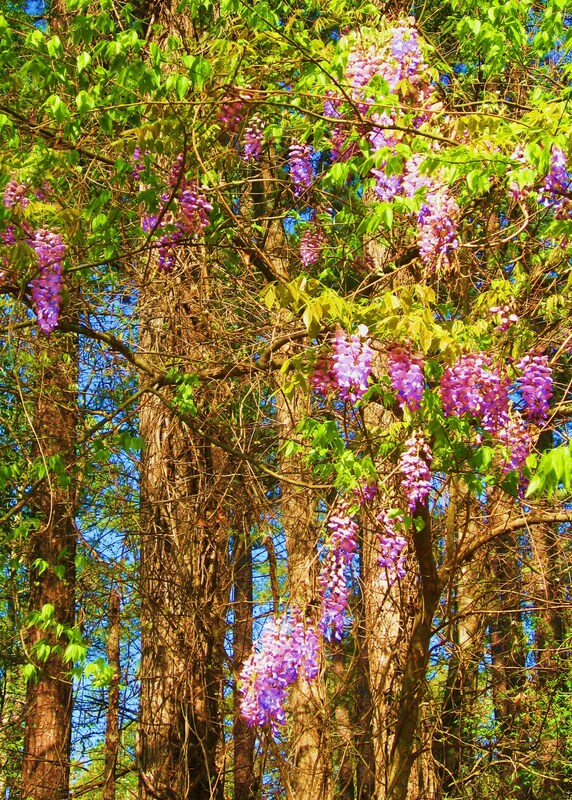 Wisteria grows wild in the forested land that partially surrounds my daughter’s five-acre rural home, and two dogwood trees grow on her side of the fence. I thought I would share their beauty with you. 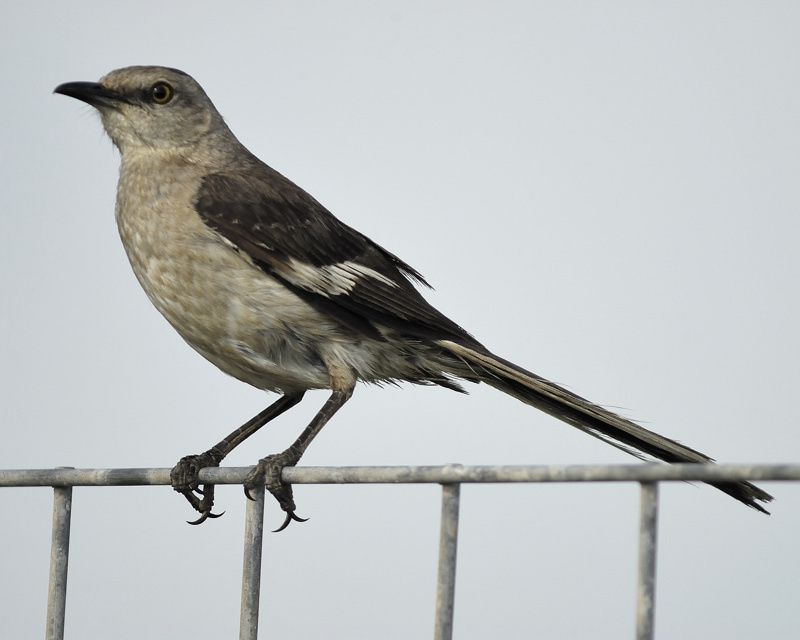 For good measure, I’ve included a picture of a northern mockingbird that hangs around my RV. It’s a familiar sight in both Texas and Arkansas, with both states claiming it as their state bird. Beautiful photos! I love the wisteria. I hope you enjoy Arkansas and your daughter. Happy travels! Still waiting for green here in southeastern PA, so your lovely photos are very welcome. Thanks so much for sharing! Beautiful photos. Wisteria is one of my favorite flowers. I especially love the scent. Your mockingbird is great. We used to see mockingbirds all the time when we lived in West Virginia. I don’t recall seeing there here, in northeastern Ohio. I wonder if they visit this area?